FINANCIALLY TROUBLED airline REDjet has officially gone under. A day after dismissing the remaining 94 employees, the carrier announced it had shut its Barbados operations and was filing for bankruptcy, blocking any legal proceedings by passengers and others owed by the airline. If the Prime Minister of Barbados is going to speak, please let him speak the common sense truth – and if he doesn’t, will the news media please call him on it? On Sunday, PM Freundel Stuart (photo above) told a Democratic Labour Party meeting that the government “has not turned its back” on REDjet, and that the government would review the company’s books prior to making a decision about the airline. This kind of ‘happy face’, deflecting statement is normal in Bajan politics to keep the PM or other big ups from having to say negative truths in public. It is a political strategy to keep the public from associating negative events with the leader. The problem is that the public becomes so used to hearing this kind of cow dung from our leadership that we too begin to accept it as ‘normal’. It’s time we had leaders who just spoke the truth. Bajans can deal with the truth. We’re not children. In the case of REDjet, everybody who has anything to do with Caribbean aviation knows that airline is dead, dead, dead. The airplanes are out of service (they were the wrong choice for the mission anyway), the ground and flight staffers are long gone and most important: whatever trust, goodwill and brand value that REDjet developed in its short life evaporated like a puddle of spilled Jet A fuel on a hot day. People are still waiting for refunds that will never come and they aren’t about to take another chance. The staff at the governments-owned Caribbean Airlines called REDjet a ‘vampire’ for sucking the passengers and cash from Caribbean Airlines in such troubled times. 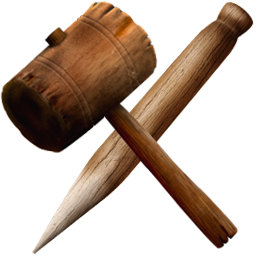 Now that REDjet lies in its grave, the surviving airlines are making sure that a couple of wooden stakes are pounded through its heart. They are determined that this phantom should never rise again. 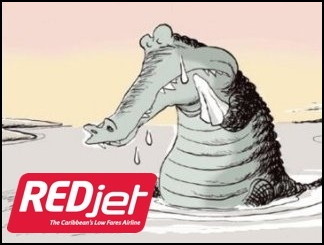 Trinidad & Tobago and Barbados revoked REDjet’s licences and after it ran into trouble and if the airline tries a return you can be sure that the company and staff will have to jump through all the hoops once again when it comes to licensing. It’s not going to be “Oh, you’re back. Here’s your papers.” That will be six months gone. Unlike our Bajan babysitter, the Prime Minister of St. Vincent and the Grenadines told it like it is. Dr. Ralph Gonsalves said he had no intention of getting involved in the any action to save the REDjet, explaining, “REDjet is privately owned, Caribbean Airlines (CAL) is owned by the governments of Trinidad and Tobago and Jamaica, LIAT is owned by the governments of Antigua and Barbuda, Barbados and St Vincent and the Grenadines”. REDjet is dead, dead, dead and Prime Minister Stuart should be saying that truth to Bajans and to foreign investors suckers seeking to revive the airline. Any investors foolish enough to try to revive REDjet will be most disappointed because it always ends the same way when private business tries to compete with businesses run by the government. REDjet: What is happening with the funds collected from pre-paid tickets? First I do not want to say or even imply anything that may negatively influence the return of REDjet, but I am surprised that no-one so far has seized on some of the financial implications. A very high proportion of any monies collected for planned future travel that has not yet been refunded, is in fact due to Government(s) and their agencies: whether they are departure taxes, VAT, landing fees or other airport charges. Should the company NOT be in a position to refund, then those passengers who paid by credit card could be protected. I am not sure of the legal position regarding Surepay payments, but at the end of the day any advance payments will be largely made up of what would be Government dues, if travel had taken place. It is also not clear whether REDjet have so far paid all its statutory obligations, such as VAT, landing fees, departures and other taxes for people that have already traveled. I think these questions have to be raised to establish if in fact further taxpayers funds should be placed in the airline.